Frontier Technology, Inc. made one round acrylic sign which was edge illuminated with blue LEDs. Other color LEDs are available. The acrylic was clear and 3/8 inch thick. We also use 1/8th and 1/4 inch thick acrylic. The image was supplied by the customer. 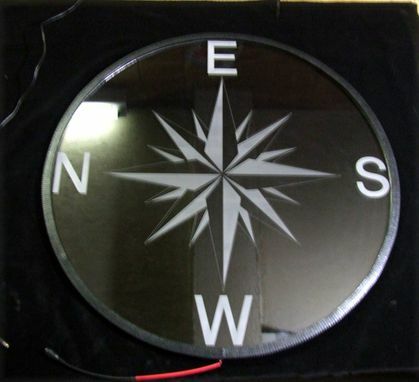 The acrylic was be laser cut forming a circle approx. 23.75 inches in dia. 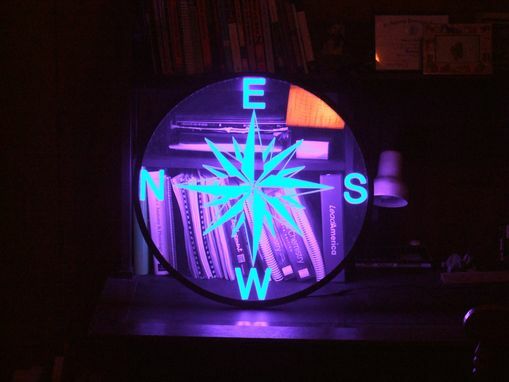 The acrylic was be laser engraved with the letters, "NSEW" and the center image. Blue LEDs were mounted around the entire perimeter and covered with a black adhesive rubber. The LEDs are spaced approx. every .6 inches. The LEDs and black adhesive were covered with a black plastic edging. The LEDs connect to a female power connector with connection sizes of 5.5mm exterior post and 2.1mm interior post. 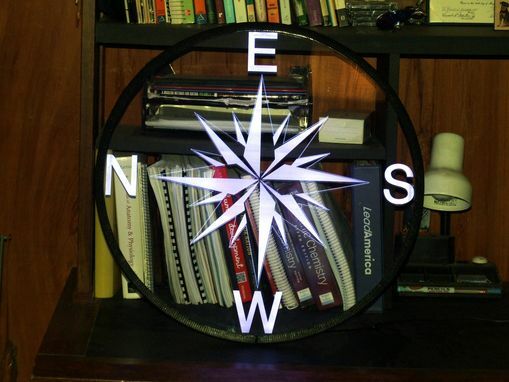 The LED Lighted Acrylic Sign is intended to be mounted in a wooden frame.